"The bitterness of poor quality remains long after the sweetness of a low price is forgotten". Pricing is available via email at hunter@desertsafaris.com. Or by calling (210)-264-1745 or (210)-764-1827. Prices are subject to change without notice. Usually the quickest way to contact us is by telephone. We appreciate your interest in our operation and look forward to providing you with the highest hunting experience available. Desert Safaris a wounded animal policy on our hunting excursions. Draw blood, bone or hair that trophy animal is deemed harvested and in full payment. For those hunters who are driving, they should schedule their arrival no sooner than 2pm the day before the hunt begins, 3-4pm is ideal. Everyone's safety and well being is Desert Safaris #1 priority, period. Consumption of alcoholic beverages is not allowed while hunting and we reserve the right to not allow a client to hunt if not of sound mind and being. After the day hunt is over and the firearms are stored, feel free to have a drink and enjoy yourself. Trophy fees for additional animals (if applicable) will be applied at the conclusion of the hunt and are to be paid before departure from camp and antlers, horns and/or capes released to client. All Desert Safaris hunts are 1st come, 1st served basis. Your Hunt dates will be held no longer than 10 days without receipt of your deposit. Deposit is not refundable unless another hunter can replace the date at full prices. It's not up to Desert Safaris to find a replacement hunter if a cancellation is requested. Prior to your arrival for hunt, an equipment list and driving directions to hunt location will be provided via U.S. Mail or email, whichever is preferred. Your reservation will be confirmed with receipt of a non-refundable deposit of 50% of the cost of your particular hunt. Upon receipt of deposit, a letter of confirmation and acknowledgement of dates will be sent to you. Deposits are non-transferable and may not be rolled over into a following year unless prior arrangements have been made in writing. Clients will be invoiced for the remaining balance 60 days prior to hunt and final balance should be paid in full no later than 30 days prior to your scheduled trip. 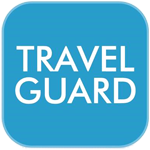 If balances are not paid 30 days prior to trip, deposit will be forfeited and trip cancelled. Type 101 License: $23.00 - hunt all legal animal or birds. Type 105 License: $315.00 hunt all legal animal or birds. 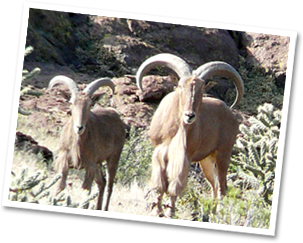 Type 157: $48.00 hunting of exotic animals and legal game birds excluding turkey, Javelina and non-game animals. All hunters in Texas with birth dates on or after 09/02/1971 must have completed Hunter Education courses. Who is Required to take Texas Hunter Education? Every hunter (including out-of-state hunters) born on or after Sept. 2, 1971, must successfully complete a Hunter Education Training Course. Minimum age of certification is 9 years of age. Age 9 through 16, you must successfully complete a Hunter Education Course, or you must be accompanied*. Age 17 and over, you must successfully complete a Hunter Education Course; or purchase a "Hunter Education Deferral" and you must be accompanied*. *Accompanied means: By a person who is at least 17 years of age, who is licensed to hunt in Texas, who has passed Hunter Education or is exempt (born before Sept. 2, 1971), and you must be within normal voice control. Proof of certification or deferral is required to be on your person while hunting. Note: Certification is not required to purchase a hunting license. You may purchase your Texas hunting licenses over the phone prior to your hunt. You will need your driver’s license, social security number and credit card. Orders may be made on line at Texas Parks & Wildlife License Please allow ample time for arrival US mail. Keep this in mind when ordering online that this may take 10-14 days. 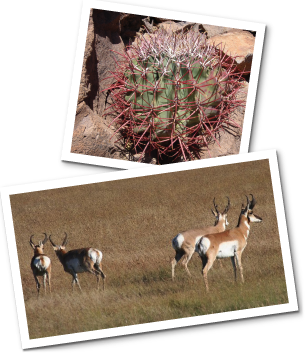 Hunting opportunities on private lands for Pronghorn Antelope go through the Antelope Private Lands Use System (A-PLUS) for qualified landowners that sign hunt agreements with the New Mexico Wildlife Department. All licenses and authorizations issued will be on a per Ranch basis and valid while within authorized ranch boundaries of the approved ranch. Should Desert Safaris be forced to cancel your reservation, we will do our best to provide you with a reasonable alternative. If both parties can't agree on a acceptable replacment date will of course reimburse the total dollar amount collected to date. 10% penalty of hunt cost for a postponement made 60 days prior to departure. 1/3 penalty of hunt cost for a postponement made less than 60 days prior to departure. There will be a surcharge for credit card charges which varies depending on card. Please call for percentage rate on amount. Clients arriving by commercial airline will fly to El Paso, Midland/Odessa, San Antonio, TX, or Hermosillo, Mexico depending upon trip. Any game wounded and not retrieved will be considered harvested and paid in full. Gratuities' for both guide and cook are customary. Amounts normally vary, but herein is a general guideline. 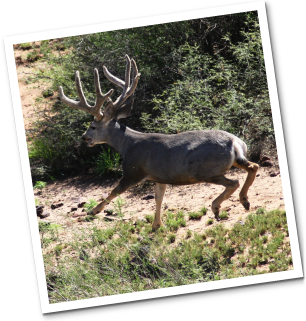 Should Desert Safaris or employees have to ship cape and antlers to client's requested destination, client will be obligated for a service charge of crating/handling of $250.00 per animal in addition to freight charges. "When we talk about where we want to hunt, my family regulary request West Texas with Desert Safaris." "I have known Hunter and his wife for more than 7 years. He is a man of fine character and unquestioned integrity. 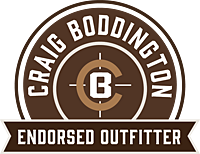 I have heard Craig Boddington recommend him on his television shows, but I know the man personally and I could not recommend any outfitter higher." "Thanks to you and your staff we had a great time in west TX! It amazed me at how organized your operation was and the top notch caliber of people you have working for you, now I know why Jenny had such a good time last year. Jenny and I both understand how hard it is to make things all work together during hunting season. You and everyone that works for you obviously have the outfitting business figured out."